This group is ment for anyone you uses my config, want to get in contact or just like it. If there is some update i would pronounce it here. Thx again to L'n'L! CloveR for his work. L'n'L! CloveR has done a translation of QLC v2.7 into Spanish. If someone wants to help me and the community with adding more languageversion PLEASE contact me. I really would like to get the QLC in more Languages translated. 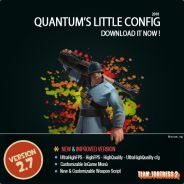 does using custom config against the game rules, can i get vac banned for it? Hey man, if you ever come online again, please consider updating.